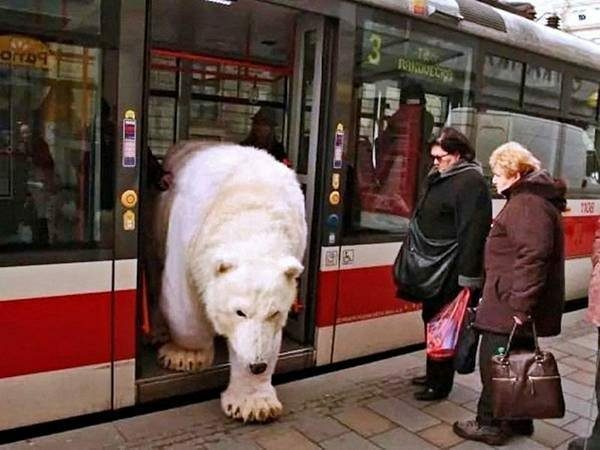 FACT CHECK: Does This Photograph Show a Polar Bear Taking Public Transit in Russia? Does This Photograph Show a Polar Bear Taking Public Transit in Russia? Is this "a normal day in Russia," or a bizarre circumstance anywhere in the world? A photograph shows a polar bear exiting a bus in Russia. This picture is a genuine photograph in the sense that it was not digitally manipulated, but it does not, as often claimed, capture a real polar bear exiting a bus in Russia. 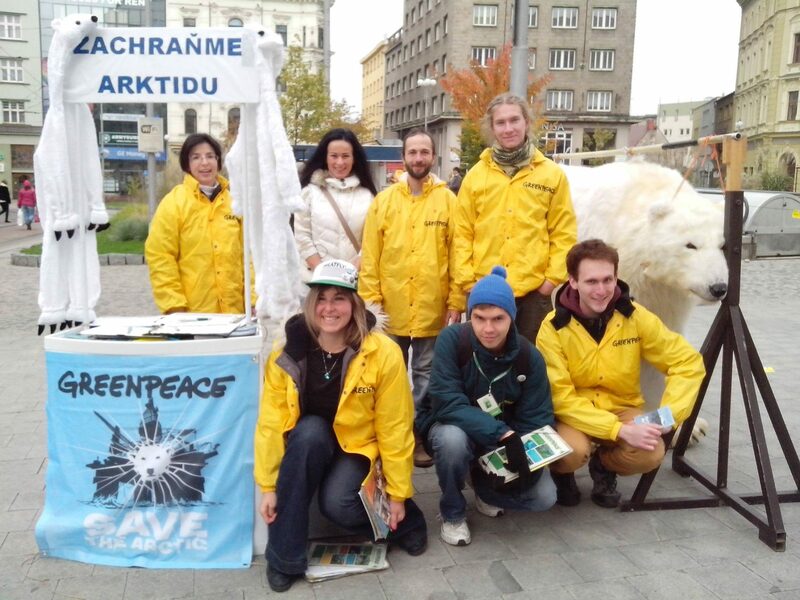 What this picture actually shows is a puppet known as “Paula the Polar Bear” exiting a tram in the Czech Republic city of Brno during a “Save the Arctic” campaign by Greenpeace. (The name of Rakovecká, a street in Brno, can be seen on the bus sign.) Two activists are actually operating this puppet from the inside as other Greenpeace members inform the public about matters such as climate change and arctic drilling. On Friday afternoon a city police patrol quickly responded to a supermarket in Židenice, where a polar bear, according to a caller, was walking around. The policemen in Bubeníčkova Street actually saw a furry white animal, but it was only a costume used by ecological activists. The bear costume was very realistic, so some of the passers-by were fooled. Two people were hidden inside the life-sized costume. “I came up with the concept after having been asked by Greenpeace to judge a short VW film competition they were running and being taken on a guided tour of the building, when I was duly shown around their warehouse and spotted a life-sized suit of a polar bear called Paula hanging from a pole — a relic from a play called ‘Greenland’ at the National Theatre in London,” says Michael. “After a brief conversation with Head of Greenpeace UK, John Sauven, about their up-and-coming Save the Arctic campaign, I took some pictures of the bear and started thinking about how I could tell her story, and a simple idea came to me: what if, because we had made her homeless, this polar bear had traveled so far in search of food that she would be living on the streets of London. The stunning polar bear costume was operated by puppeteers from London’s Broadway and West End production ‘War Horse’ who rehearsed the bear’s articulations. A team of post-effects artists from London’s Moving Picture Company worked on face manipulation.